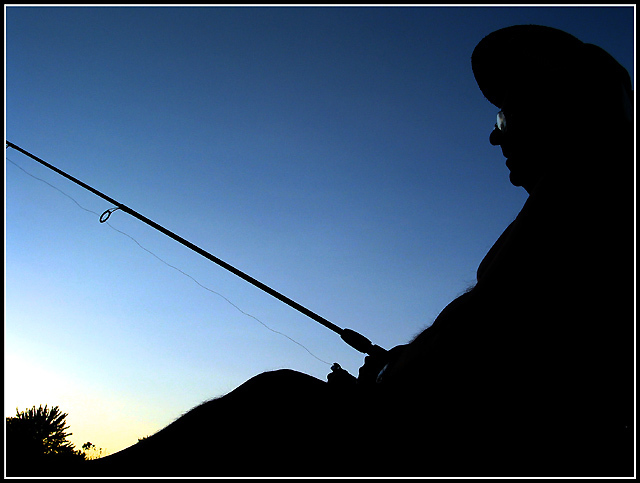 This is a shot of my father relaxing and fishing Sunday evening. This epitomizes his lifestyle since he has retired. Excellent photo,one of my favorites,1 of the tens is mine ,of course! This is such a nice photo. The sky is simply beautiful the sillioutte is very nice and the detail of it is fantastic. It definately is a beautiful capture of a retired lifestyle. There is a slight halo though going around the outside of the entire image which was probably caused by editing. Try to watchout for that, cause it really is the only flaw in the entire image. Personally I do believe it fits the at work challenge cause a man who is retired makes a living doing what he sees fit. Excellent sillioutte. The picture is so in focus I think I can even see hair on the man's stomach. Great shot! 8. Nice silhouette against a nice clear sky. It would be good if you zoomed out a bit a think, and get the whole of the fishing rod in frame. Beautifully done. Love the silhouette. Very peaceful and the sunset is lovely. The chest hair really makes this shot... the dark works well here, as seeing the person more clearly probably would detract from this. Very nice composition. 10 points. Good pic! Tiny bit washed out at the trees(?) at lower left. Would like to see the end of the rod, rather than have it lead me off page, but a good strong 9 none the less. Update: After finishing voting, this is my pick for the week, now 10. I like this image. I'm a big fan of silhouettes. The problem is, this doesn't represent anyone at work. I struggled to find people at work to take their pictures, and this seems to be the ez way out. I hope this doesn't offend you. I don't mean to. It's just that I could have easily taken a pic of myself or other family members at r & r.
With that out of the way, I love this image. The lighting and coloring is perfect and the composition is superb. Beautiful! Lovely shot, the backlighting produced nice contrast and silloute. I think retirement skirts this challenge, but I guess this would be work for the retired person. (I bet this is probably your angle). Lovely silouhette effect. The layering of the sky tones from dark at the top to light at the bottom really boosts the charachter of this photo - 10. Proudly hosted by Sargasso Networks. Current Server Time: 04/20/2019 08:28:26 PM EDT.